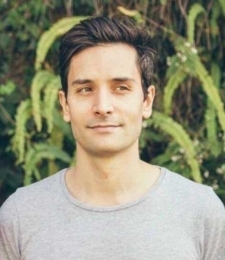 Nick is a 800 hour certified Jivamukti yoga teacher who, after countless hours in recording studios for over 10 years, has now moved on to dedicate himself to the practice of yoga. Yoga was a way for Nick to focus and clear his mind from his work within the music industry. Nick”s inquiry into the practice has deepened over recent years, through dedicated exploration of the Jivamukti method. Nick’s classes are dynamic, but at the same time, not losing sight of why we actually practice and always being conscious that our yoga practice does not become a mechanical exercise that one simply does. Nick feels privileged to teach and looks forward to being of service to every student that he comes across. He hopes to inspire awareness, knowing that what happens on the mat has the possibility to translate how we conduct ourselves off the mat. Unfortunately, we could not find a date this year for Nick to teach on a destination yoga holiday, but very much hope to again in the not too distant future.